The F Fund is modeled by the bond fund AGG. AGG is trading as expected. Since last week there has been no change in the fundamentals or technical nature of AGG. To reiterate, from January to mid-May, AGG consolidated between $101.5 to $104 in a descending triangle formation. Normally, the descending triangle is a bearish formation that forms during a downtrend as a continuation pattern. Thhere are some instances when they form as reversal patterns at the end of an uptrend, but they are typically continuation patterns. The latter seems to be the case for the current trading history of AGG. Regardless of where they form, descending triangles are bearish patterns that indicate distribution. 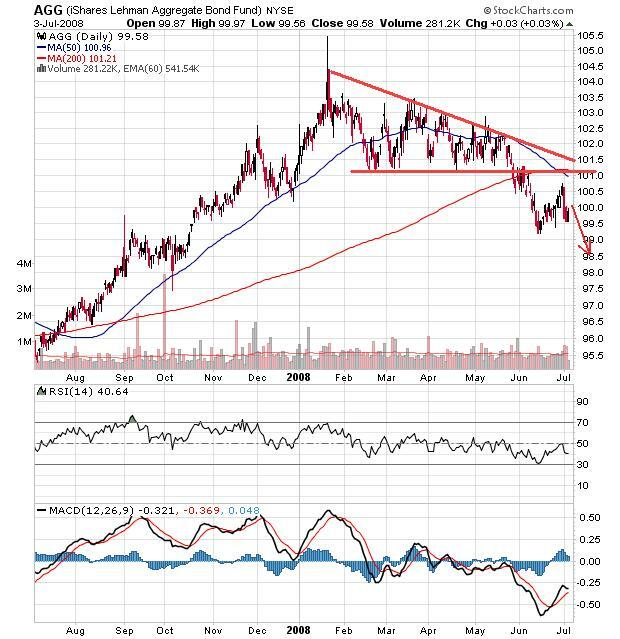 In late-May, AGG broke below the lower supporting trendline of this zone of consolidation. As stated in previous newsletters, we strongly believed the overall trend would be down for AGG and it has. Notice on the chart, that the 50-dma (day moving average) is now crossing below the 200-dma. This is known as the "death cross", and it implies the index is in a possible long-term bearish environment. Then out of the blue, AGG found some form of support at 99.2. We mentioned that the 50- and 200-dma's will probably serve as strong resistance. The bond fund has bounced back to these levels, but could not break through as expected. Now the fund seems to be trading lower. The yield and bond fund are not exact reciprocals of each other. Though, they do provide some insight regarding the overall inverse of trend of one another and stability of the indexes. Normally when the yield declines, bond prices rise. 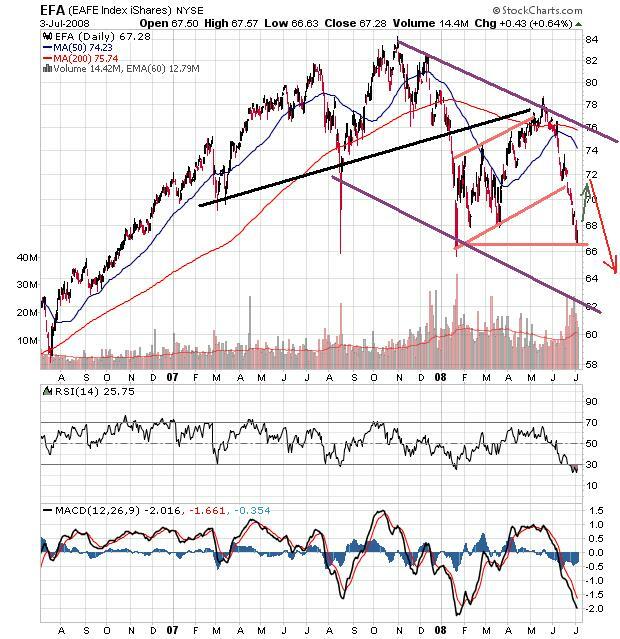 Therefore, by charting TNX (below), this can only help in interpreting the future direction of the bond fund AGG. 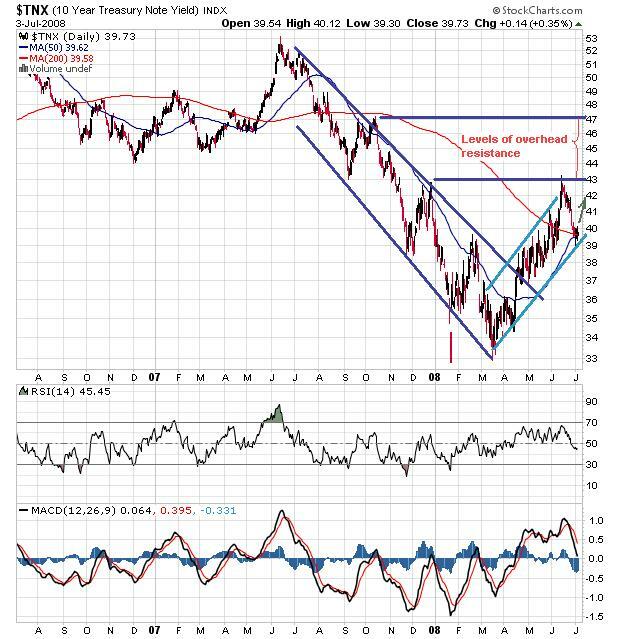 As shown in the two-year chart above, bond yields have climbed back above its 200-day moving average and remain in a clear uptrending channel. If the uptrend remains intact for the yield, this will continue to put pressure on bond prices. We believe TNX will continue higher since its 50-dma is crossing over the 200-dma. This cross-over is known as the "golden cross" and represents a bullish environment for the yield (bearish for bonds). In all likelihood, TNX will go up next week, while the F Fund declines. The C Fund is modeled by the S&P 500 Index ($SPX). We now have a portion of our savings in a long position for the C Fund (20%G, 40%C, 40%I). Since mid-May, the market indexes have plummeted. On Tuesday, the S&P index finally put in a nice reversal, which could very well set us up for a rally back to the 50-dma (day moving average). 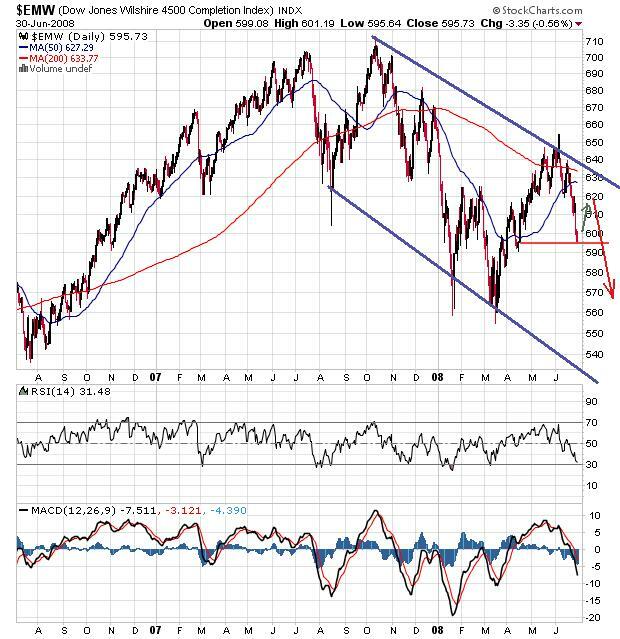 We were a little too quick with our last IFT back into the stock funds, but there is still a chance we can make it profitable if this rally extends long enough. Overall, we continue to be long-term bearish on the market indexes. 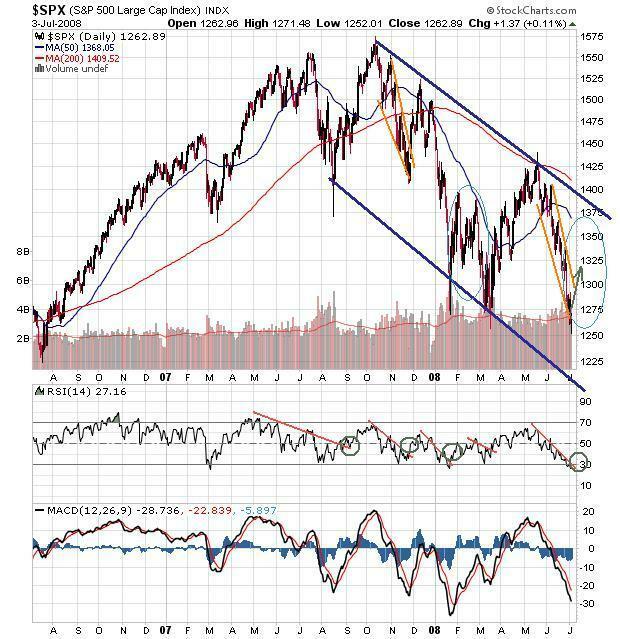 As shown on the SPX chart below, the index is very oversold. If SPX can rally back to around 1330, that would equate to about a 4% bounce. We anticipate that is the approximate price where the stock will encounter the down-curling 50-dma, which will probably serve as resistance. If we get the long-awaited bounce, we will look for a price/level to go back to the G Fund, or we may incrementally move money out of the C Fund and into the G. This is totally within the rules of the new TSP guidelines. Once we make a second trade, we can not switch to a new stock fund ... we can only decrease that position in the stock fund(s), while increasing our position in government securities (G Fund). In summary, if the S&P can follow through to the upside, for resistance we have the 50-dma and the downtrend since October '07, which may reside somewhere inbetween the 50- and 200-dma's. We strongly believe any rally attempt will come to a scretching hault at one of these levels of resistance. We believe the current charting pattern will perform much like the rally in late-Nov/early-Dec '07 (i.e., not to exceed 10 trading days from a bottom). In addition to the market being highly oversold, the days surrounding the Independence Day Holiday (see chart below) are normally positive days as well, which could contribute to this much anticipated bearish rally. I say bearish rally, because it is highly likely that any rally attempt will be short-lived, then the selling pressure will resume. Another interesting chart is a historical seasonality chart of July. What it implies is that the market could do well for the few days days of July (before and after July 4th), then sell off, then renewed buying late in the 3rd and throughout the 4th weeks of July. If this is the case, then the charting pattern could look much like the trading history from about mid-January through the end of Febuary 2008. After that comes the major selloff to the bottom of the bear market. This is all speculative, but could very well happen. We still believe the October 2007 high was a significant top of historical significance, and the market indexes may not reach a bottom until late 2008. 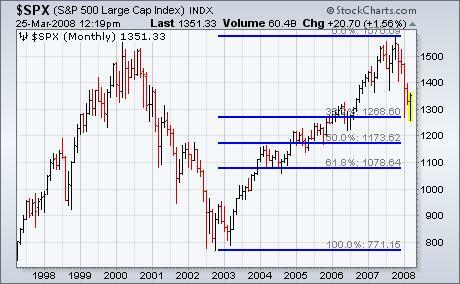 From the S&P's 2002 bottom to its 2007 top, it found support at its 38.2% retracement line (see chart below). That's a logical support point for a short- to intermediate-term correction. However, the stock market normally declines in five waves during bear markets. In Elliott Wave work, that usually suggests the possibility of another major downleg after any short-to-intermediate rebound. Meaning, the market may drop significantly later in the year. The S Fund is modeled by the Dow Jones Wilshire 4500 Completion Index ($EMW). A little over a month ago was when the countertrend rally came to an end. Since then the index has plummeted. Last week we wrote, ... "The next level of support are the lows of April at ~590, then March at ~560." EMW seems to have found support just above the lows of April and is now bouncing back to its 50-dma. However, we feel the upside potential is very limited because the 50-dma will probably serve as resistance. Once reached, EMW should decline once again and the selling pressure should resume. The I Fund is modeled by the EAFE Index iShares (EFA). As shown in the above chart, the countertrend rally came to an end in mid-May. Since then, EFA has plumeted in value, and has reached the lows of 2008. From here, we expect the index to bounce in price back towards the 50-dma. If the index can gain some form of traction to the upside, we will look for a place to either exit our position or decrease the amount we have in the I Fund (it is 40% at the moment) and increase the amount in the G Fund. Long-term we are bearish for all stock funds. Our success has been portrayed by a good majority of previous members renewing to our service when their term has expired. We also welcome all the new members who have signed on. Please help us spread the word to government employees (active and retired) who may not know about our service. Thank you! Copyright © 2005-2014 TSPFundTrading.com, LLC (a division of TSP Financial Investment Strategies, LLC). All Rights Reserved.